In this blog, I am continuously exploring and suggesting new approaches to capturing and handling dogs. The most proficient individuals who do this are animal control officers and I wish to make it very clear that I honor their skills, knowledge, and experience. 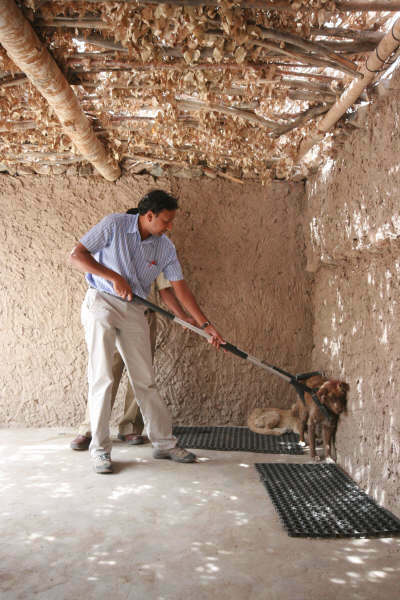 It is common around the world for the village or city or regional animal control to hire the poorest, least educated dog catchers to do what is perceived as the dirty work. There is no sense of humane treatment or animal protection. And in some countries, especially where rabies is endemic and dogs run the streets, there is a bounty for people to bring in as many dead dogs as they can. I have seen photos of a motor scooter with 5 dead dogs piled across the front and back. So what kind of double standard is their in how we view dogs? Just think about the warm cuddly Cockapoo or the goofy black lab with a tail that knocks everything over in the house. It is easy to have compassion for them. If we see them suffering we quickly wish to help them and are sad for that animal’s suffering. The compassion is a reflex. But what are we thinking or how are we reacting when a dog in a kennel suddenly becomes very aggressive or a dog in a pen from a hoarding case growls when you approach the pen? How often are we sad for that animal? And how often do we really try to figure out why that animal is showing “aggression”. Instead it is common to see those snarling teeth and those raised lips with attitude as we tense up, then we try to figure out how we are going to win with this conflict. “How can you have sympathy for a dog who doesn’t even want to cooperate.” “If it thinks it can win, it is fooling itself because I am going to win.” Such words are common. I once helped coordinate caring for a hoarding case where almost 100 dogs were confiscated from an owner trying to transport them in a school bus (without chairs) and trailer. I was not there when they took the dogs out of the bus but I was told it was total craziness with people trying to grab many of the dogs chained in the bus and several people getting bit. It certainly wasn’t pretty trying to get those dogs out and into holding pens. So are dogs which show aggression truly aggressive? They certainly can be. And it is definitely a potentially dangerous situation so we have to always address human safety. But it does not have to be a fight. It may not be a fight if we try softer, slower techniques first and realize how OUR energy, emotions, thoughts and actions dramatically influence how the dog reacts to you. And if we cannot feel compassion for that snarling dog the way we have compassion for that goofy black lab, then the dog will feel that as well and trust us less. So when we are faced with aggressive acting dogs, let’s understand that most dogs show aggression because they are simply defending themselves because they are deeply afraid and we can use that as a tool by softening their fear making them easier to work with. We can relax and move slow and at times not move at all. We may choose to use the Y pole to protect ourselves while using it simply as an extension of our hand to pet the dog – first by mouth to let it bite then later on the head and neck. We can strive to create the calmest, most compassionate environment for the dog, then use tools with a “quieter energy” such as the Y pole. If the dog accepts we will have diverted a fight. If the dog refuses to give up it’s fear and cooperate or if it is truly an aggressive dog who thinks he is alpha, then we have to use stronger methods. I have always taught, “The crazier the animal is, the calmer we can be”. The self awareness that is required for this approach and the practice of being calm and compassionate is the foundation for successfully working with fractious dogs. 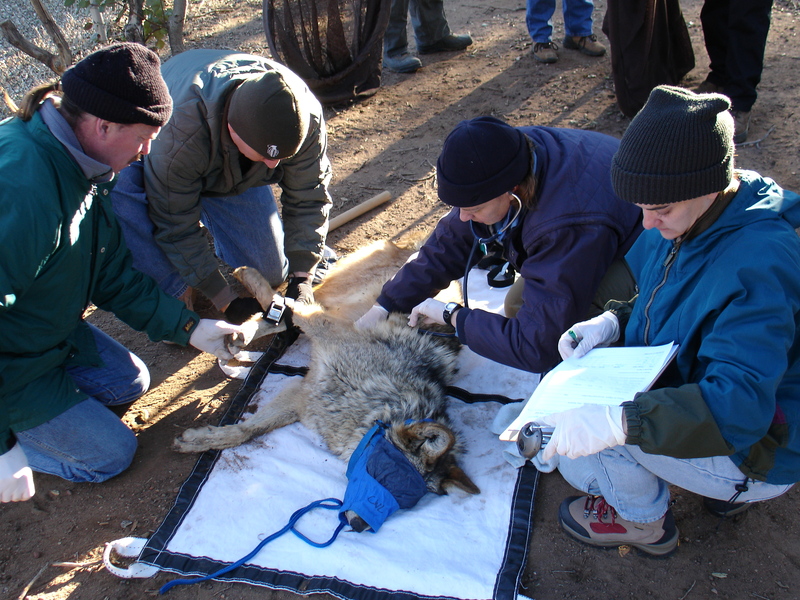 In my wildlife chemical immobilization courses (see my Seminar Schedule) I teach about connecting with the animals. 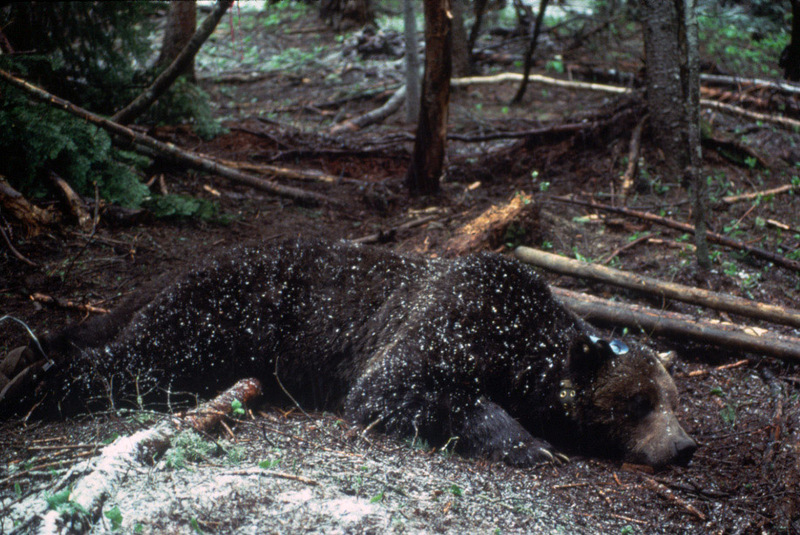 Even when I approach a black or grizzly bear in a Culvert trap, administer immobilizing drugs, radio-collar them and release them, I still create and feel a connection with the animal which improves how well I can care for them while they are under the drugs. My understanding of connecting totally changed after I was given a behind the scenes tour of the San Diego Zoo. 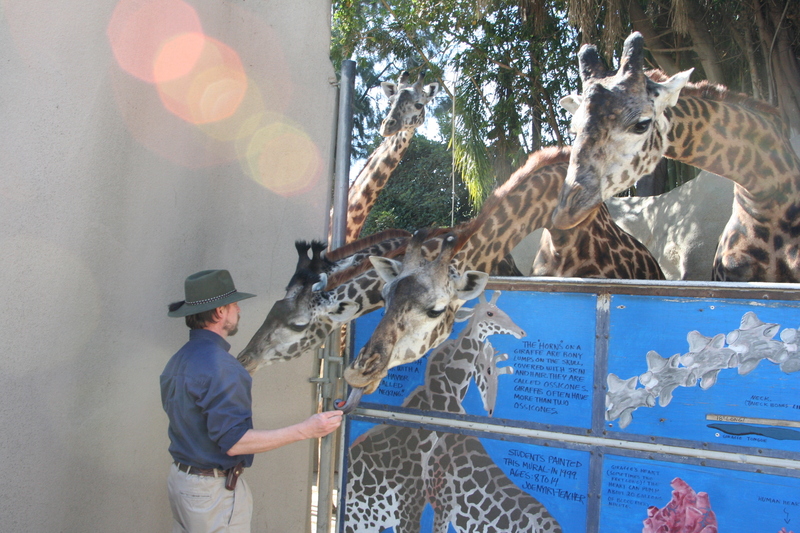 Animal caretakers must monitor and treat the health of their animals which can involve blood collection and nail trims even with animals such as giraffes, tigers or polar bears. 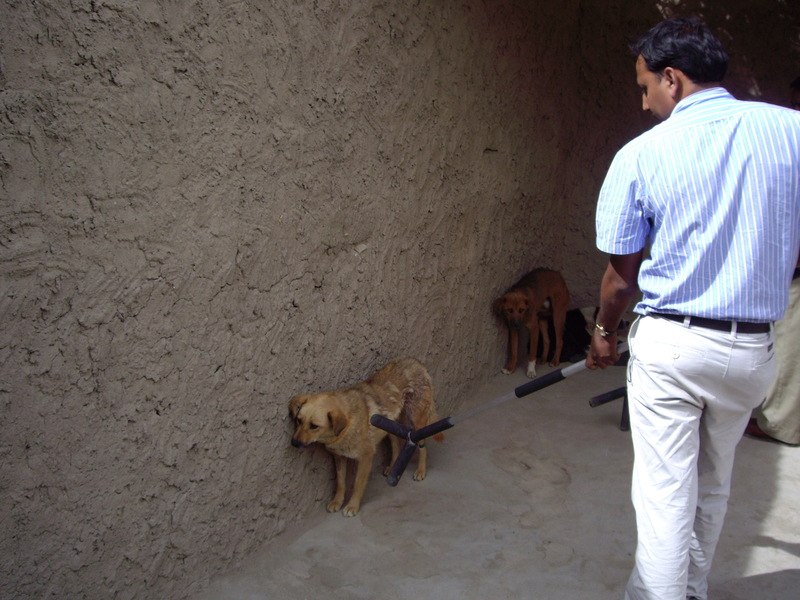 To reduce the risk and invasiveness of drugging the animals they create a close bond with the animal through training and ask the animals to help. I was in awe as the caretaker asked the Siberian tiger to bring it’s huge tail through the bars so he could collect blood! This is not just physically forcing an animal to do anything. It is asking the animal to cooperate and participate. And the caretakers recognize that the animals have their good days and bad days. There is give and take between the animal caretaker and the animal. This is a wonderful connection. 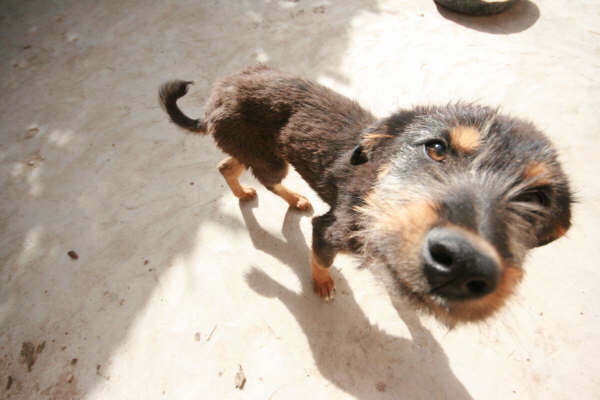 Have You Rescued Dogs in the Wake of A Disaster? 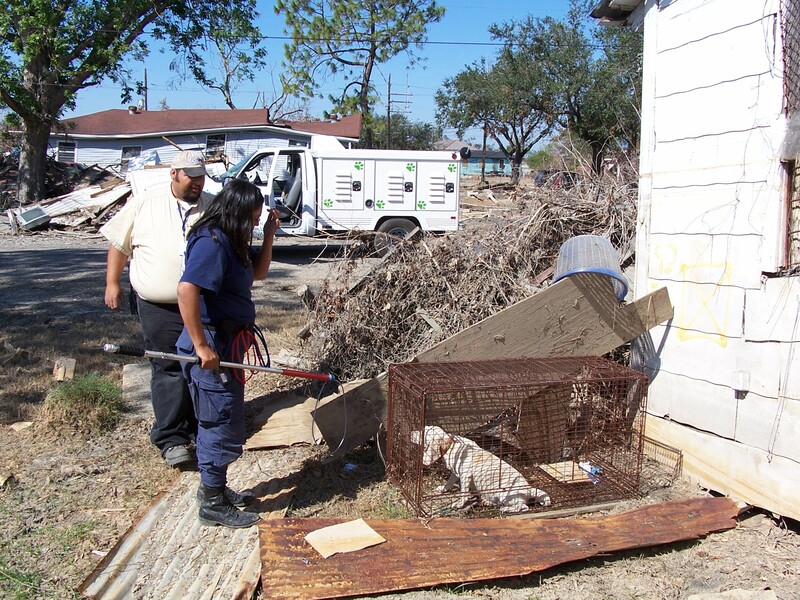 Have you captured or gathered dogs in a disaster response? I would like to hear from you. I made three trips to Louisiana and Mississippi after Hurricane Katrina at the request of the Humane Society of the US and have great respect for those who respond to disaster situations. I remember working in the city of New Orleans as the waters receded. You could look down the flat neighborhood streets still under water with empty houses as far as you can see. As the sun set we were leaving the city, a few scattered lights from generators lit a window or two throughout the tall complex of the downtown area. And during the whole time there was a sweet stench from the water which contained everything under the kitchen sink and more. Most of the local people I proudly worked with had lost their homes. It was remarkable they were even there. And they worked so exhausted that their short nights rest could not soothe them. We did not know when the next meal would be – dependent and grateful for the styrofoam boxed food from Red Cross. 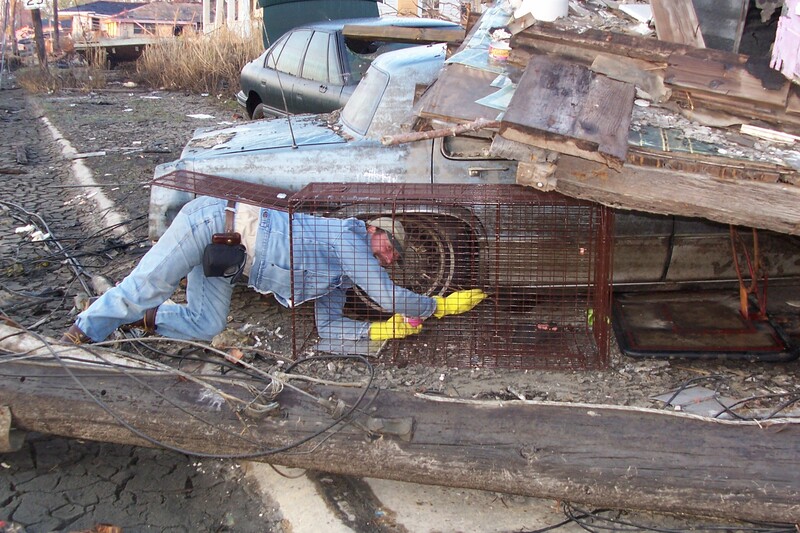 These are extremely challenging conditions for the people rescuing dogs. Exhausted, they often place themselves in threatening situations handling defensive dogs they typically would not handle. One of the purposes of my blog and website is to provide practical, effective, and safe methods and equipment for the disaster responder. Hopefully as a result of this information more animals will be rescued, fewer rescuers will be bitten, and the experience will be better for everyone. Disaster responders: What dogs have been dangerous or difficult for you to capture and rescue? What situations have you been in that were challenging for you to catch dogs? We would like to hear your stories and needs. The dog family, Canidae, which includes dogs, wolves, and coyotes love to hide. They feel very safe hidden away in their dens. Whenever you are working with dogs, cover their heads with a towel, or cover their trap or crate when you move them. And some people will really like using this headcover. 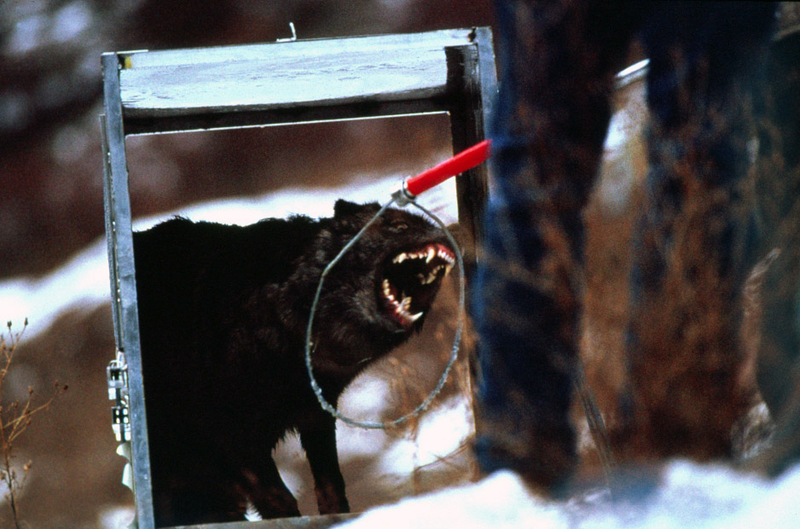 Over the years I have worked with hundreds of wild and captive wolves. When I first get them in hand with a Y pole I cover their head with a towel. Even when I catch wolves (or dogs) with a net, I cover them with a towel to help calm them down and to make is safer for me to handle them. Some programs will really like using the headcover. The one I am writing about here is called the Wolf Quick Muzzle from Four Flags Over Aspen in Minnesota. We typically put this on the dog or wolf after we have drugged them. When it is anesthetized it protects their eyes from sunlight. And as they wake up, they are still in the dark which is safer for the people and makes things quieter for the dog or wolf. 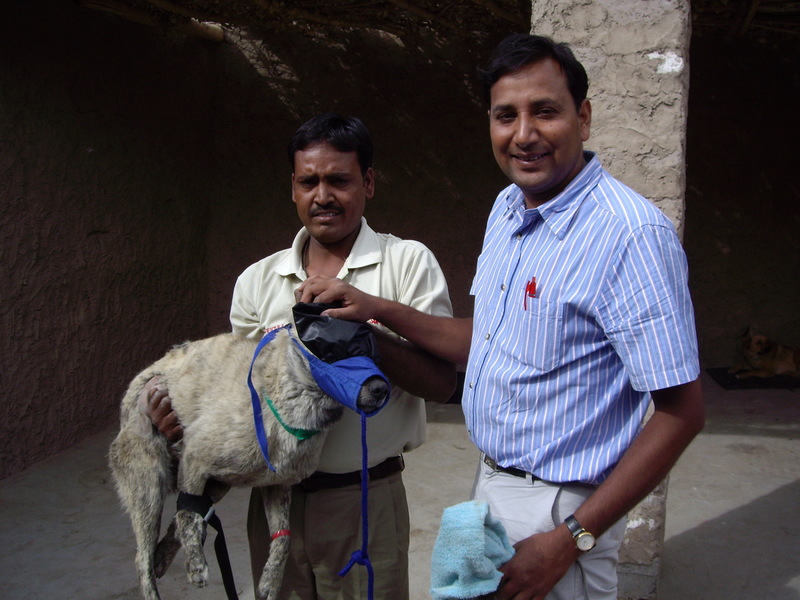 I brought several headcovers with me when working with the Ladakhi Animal Care Society in India with Vets Beyond Borders. This is a trap/neuter/release program. The surgeons really liked the headcovers. It was much safer for them and the dogs woke up more slowly. 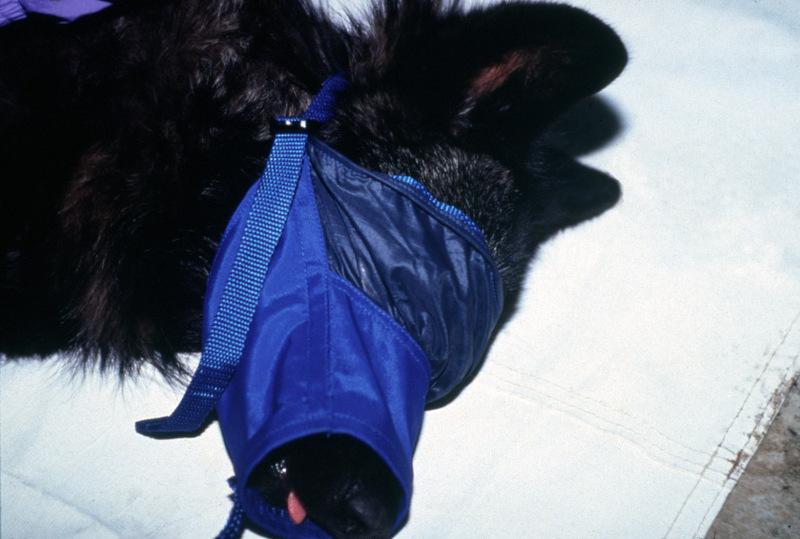 Sometimes over the years when we have to move a dog or a wolf from one pen to another we can calmly approach and humanely control the animal with the Y pole, put a towel over its head, put hobbles on, then put a headcover on. The headcover truly has a calming effect and we can pick up the animal, carry it to another location, then release. Do any of you have experiences with covering the dogs to calm them down? I would love to hear your story.